‘Made in Nottingham’ design store showcases over 40 Nottingham designer makers and brands at their location at intu Broadmarsh, Nottingham - championing local Nottingham products and talent. They have given 8 local people employment since opening, continuing to employ 4 team members that creatively contribute to the progress and running of these stores. The new location of the store, on the main mall, at intu Broadmarsh. Made in Nottingham has recruited with the support of Nottingham Jobs. Nottingham Jobs is the City Council's employment and skills brokerage service providing specialist support to employers and job seekers within Nottingham and its neighbourhoods. It is delivered in partnership with the DWP, Futures Advice, Skills and Employment and community and neighbourhood organisations, with funding from the European Social Investment Fund. Councillor Sam Webster, Portfolio Holder for Business, Education and Skills at Nottingham City Council, said; “Independent retailers are an important part of Nottingham’s vibrant and growing economy and it’s great to see that Made in Nottingham have been recognised nationally for their contribution to the city. The wide range of independent retailers in Nottingham is great news for shoppers and visitors, it’s also a sign that the city’s innovative and entrepreneurial spirit is doing well. Made in Nottingham also took part in the City Council’s Apprenticeship Scheme that saw Chelsea White from Clifton, Nottingham, receive her Diploma in Digital Marketing and earn her a promotion to Visual Merchandising assistant for the store. Mary Corcoran, Creative Director for the store, was previously a finalist of the City Council’s ‘Inspiring Retail’ awards, was previously knitwear designer for Paul Smith catwalk collection for 11 years, and Knitwear Designer of the Year in Ireland in 1996, and was headhunted to work in the then thriving knitwear industry from Ireland in 1997. She met Ben Rawson of Rawson Photography through the Creative Quarter and together they co-founded the store brand in 2014.
intu Broadmarsh first gave Made in Nottingham the opportunity to run a 6 week pop-up store in 2014 and were asked to return on a more permanent basis in autumn 2015, where they opened 2 stores in the centre. Brands in the store include - award winning Sauce & Brown menswear from Annesley, Nottinghamshire, The Nottingham Candle company, award winning Eco designer Sarah Turner, Stewarts Coffee which is roasted in the city itself and Nottingham cityscape photographer and Made in Nottingham Director, Ben Rawson. Made in Nottingham has been awarded the following - retail industry Sceptre Award ‘Short term business’ award 2016, Small Awards ‘High Street Hero UK’ winner in June 2017. They have been selected one of the 100 best small independent businesses in the UK, by ‘Small Business Saturday’s’ national selection, ‘Small Biz100’ for 2017, where their business will be celebrated through social media nationally on Oct 20th, with each business being assigned a single day until Dec 2nd, - Small Business Saturday. Small Business Saturday is a grassroots campaign that highlights small business success and encourages customers to support small businesses in their communities. The day itself takes place on the first Saturday in December each year and the campaign aims to have a lasting impact on small businesses. In 2017 Small Business Saturday will take place on Saturday 2nd December. 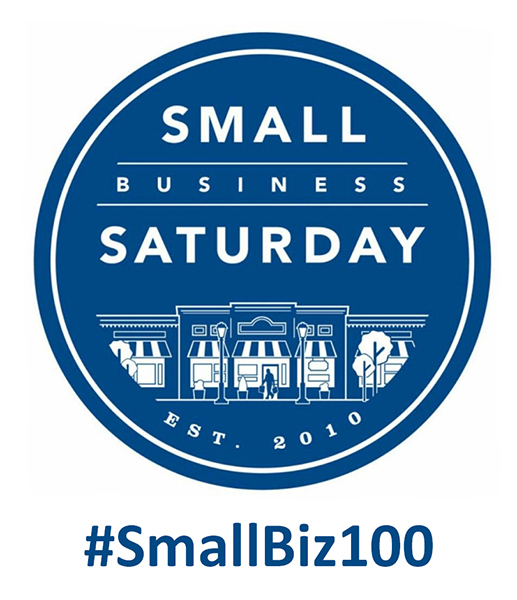 Small Business Saturday was originally founded by American Express in the U.S. in 2010 and it remains the principal supporter of the campaign in the UK, as part of its on-going commitment to encourage consumers to shop small. Each Business selected also will visit 10 downing street to meet the chancellor of the Exchequer to strengthen the drive to encourage small business and supporting this on the high street. Nigel Wheatley, general manager for intu in Nottingham said: “We are delighted that Made in Nottingham has been selected for the SmallBiz100 – this is great news for retail and showcases how Made in Nottingham has succeeded in bringing together fantastic talent locally. It is with great pride that Made in Nottingham celebrate their winning ‘High Street Hero” at the Small Awards! Shortlisted alongside some extremely tough yet talented competition from around the UK, including Nottingham neighbours, menswear brand Sauce & Brown, this new National awards event celebrates all that is brilliant and market leading about independent small business. In its’ inaugural year, the Small Awards are sponsored by Facebook, Mercedes Benz, Sagepay and other noteworthy sponsors. 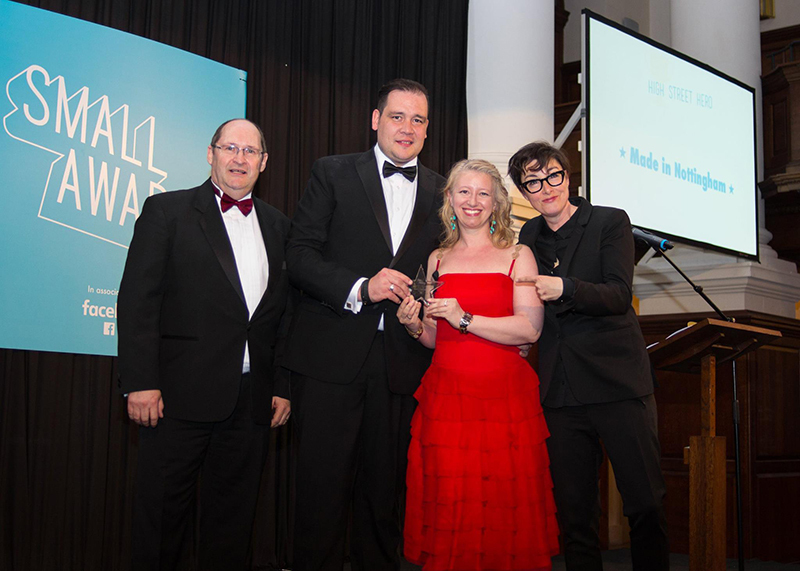 Held on 25 May at the splendid Christ Church Spitalfields, in the edgy area of Brick Lane, London, the black tie event was hosted by the superbly naturally funny Sue Perkins. Representing the Made in Nottingham team on the night was Creative Director Mary Corcoran and Commercial Director Ben Rawson. The list of judges read like a who’s who of business and entrepreneurship - Sir Vince Cable, Kiki Loizou, Small Business Editor of The Sunday Times, Ed Vaizey MP, Dawn Whitley MBE, CEO of National Enterprise Network, Elizabeth Anderson, Business Editor at The I Paper, Joel Hills, Business Editor, ITV News, to name a few. This looks for a strong high street business that has a proven record of contributing towards the success of their street. Made in Nottingham were commended for being an active member of their community that work to drive footfall to their business and neighbouring businesses. The award recognizes both long-standing businesses and younger businesses that are doing something exceptional with their premises. ‘Made in Nottingham’ design stores currently showcase over 40 Nottingham designer makers and brands over two locations in intu Broadmarsh Shopping Centre, Nottingham - a flagship design store and a Food Emporium both championing local Nottingham products and talent. They employ 6 local people that creatively contribute to the progress and running of these stores. The new location of the flagship store, on the main mall at intu Broadmarsh, heralds a new era and much awaited redevelopment for the shopping centre itself. Anna Jespersen, Store Manager and founder of Nottingham Candle Co, Mapped Out Designs - "When I started working at Made in Nottingham, Ben and Mary encouraged me to create my own brand in store... I now have two! Both going from strength to strength. I even make my product in store - the customers can see the artist at work. I also love having direct contact with the other designer makers -. I get to share their stories with our customers, so I can let everybody know just how creative Nottingham is!" Entered for an Industry Award by INTU Broadmarsh!! The Retail management team at intu have selected the 'Made in Nottingham' Pop-up Design store, from stores in over 15 of their INTU shopping centres nationwide, to be put forward for the prestigious 'Sceptre' industry Awards, under the category 'Short Term Retailer Award'. Shopping centre and retail outlets from all the UK take part, so there is high competition. We are honoured and thankful to the incredibly supportive management at INTU for taking this leap of faith with us - we should hear over the next few weeks if Sceptre have shortlisted 'Made in Nottingham'. We hope we can win it! First Tuesday at Antenna Nottingham was the perfect platform to showcase the launch of Made in Nottingham Pop up Design Store. In impromptu slideshow was thrown together in true MiN style to explain to our very supportive networking group. The Kenya Build Raffle - what a great story - Ian Ballinger, a DIY enthusiast, who has worked for many various company in the East midlands, decided to take two weeks out in May 2015 to head over to a small Kenyan village to share his ‘making’ skills, to help to build schools and houses. It includes making bricks from scratch using local raw materials as best they can. This story based on ‘sharing your making skills’, caught the attention and captured the imagination of the MiN store and we wanted to support Ian in raising the funds to get over to share is making skills. The raffle will be drawn in May so if you would like to buy tickets to be in with a chance, or would just like to donate go to his Justgiving account. Yen at Paguro accessories organised a campaign on her website for the Feb ‘Month of Love’ so that for every item sold online on her website, £1 would be donated to the Kenyan Build Fund. How do you put together a store in 7 days or less? The new 'Made in Nottingham' designer pop-up store has done just that. Situated in the redeveloped Upper floor in the intu Broadmarsh 'Independents' area, a collection of designer-makers have been brought together with a vision to celebrate the key talents that have made Nottingham and surrounds famous. Inspired by the city, then created, crafted by the designers that live here and love it here. With sound advice from the City Council's 'Inspiring Retail' team and from CQ HQ, they have brought together a mix of established and start-up brands to showcase the design hub that Nottingham can provide. Think 'loft concept' design store, it brings together over 20 designers, it is a wonderfully relaxed environment for shoppers to buy affordable hand-crafted, beautifully designed pieces, to meet the maker in-store and to get involved in bringing life back to our high street. 'Made in Nottingham' is proud to be part of the collective connection in the city that includes - Cobden Chambers, City Arts Hockley, Sneinton, and others. Products include - Menswear clothing, photography, home textiles, knitting crafts, vintage treasure, womenswear, African printed textiles, iconic paper craft, lighting, jewellery, gift cards...all great quality individually crafted pieces. There will also be interactive events by key makers in store, including design workshops, free gift wrapping...and much more. With unstoppable support from the Broadmarsh intu management team, the store has been turned around in just under 7 days. Opening this weekend Nov 28 until Jan 11 2015, and benefitting from the extended INTU Xmas shopping hours, it will be the perfect place to shop and enjoy a creative Nottingham under one roof.